We all have idiosyncrasies….strange habits that make us unique. Here’s one of mine. I have an aversion to pink paper clips. I don’t know where it came from and I cannot explain it. I am not making a political statement. It’s not a macho thing. I just have to say it’s me. Maybe I’ll outgrow it. I know I hated peaches until I turned about age 25 and now like them. Who knows if my feeling about pink paper clips will change the same way. 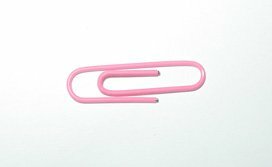 On rare occasions clients of our Redlands CPA firm will bring in their tax or accounting documents with a pink paper clip. First time I made comment about the ugly thing attached to the documents I almost lost a client. For a while I made no comment and quietly disposed of the clip like an intruder to my office as soon as my client left. Now I can talk about my pink paper clip issues openly with some clients who would appreciate the humor of the situation. Showing a glimpse of your human side in a professional setting can help solidify your relationships with your clients and customers. This approach will only work if you only do this occasionally in the right setting and if you can provide integrity and quality in your product or services. You don’t want to come off as too quirky so the professional level of your work will take a backseat in your client or customer’s eyes. You want to make sure that your client or customer is the focus of your meetings and not your unique traits. Bottom line,…it’s easier to be yourself in both your business and personal relationships than to put up a front to try to meet a client or customer’s expectations. You may find that the people you do business with appreciate you more and you will have a Life Less Taxing.